Do you have a tattoo you don’t want anymore? Maybe you got a new job, or the boyfriend you thought was forever didn’t turn out that way. Or perhaps you don’t want your tattoo completely removed, just lightened in preparation for a cover-up. Whatever your reason, the decision to remove a tattoo is easy with the UltraLight-Q YAG laser, now available at Dermess. Old methods of tattoo removal involved burning, scraping or cutting out the tattoo. Even early lasers worked by burning rather than fading tattoos. The resulting scar was frequently worse than the original tattoo! The UltraLight-Q is a Q-Switch YAG laser. 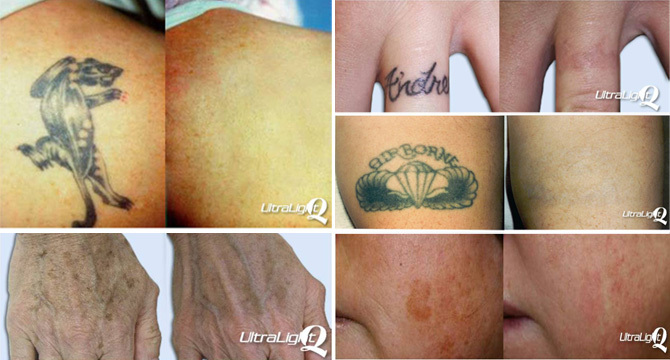 Q-Switch lasers are better because they remove the tattoo while minimizing damage to the skin. Q-Switch lasers work by causing the ink in the skin to “fracture”. These small ink particles are then removed by the body’s immune system. The tattoo fades gradually with each treatment, so multiple treatments are required. The UltraLight-Q can also be used on other pigmented areas – like freckles and brown spots – and to remove vascular lesions or broken capillaries. At Dermess Renewal, we don’t purchase any new equipment or recommend any treatment until we’ve studied it thoroughly and tested it on ourselves. Your tattoo removal treatment will be physician supervised, with the necessary pain alleviation. We’re really excited about the UltraLight-Q and other new offerings in the works. Watch our blog for more to come! Purchase 3 15-minute Tattoo Removal Treatments for $250 Each and Get the 4th Treatment Free! This entry was posted on Thursday, March 24th, 2011 at 5:36 pm	and is filed under Uncategorized. You can follow any responses to this entry through the RSS 2.0 feed. You can leave a response, or trackback from your own site.